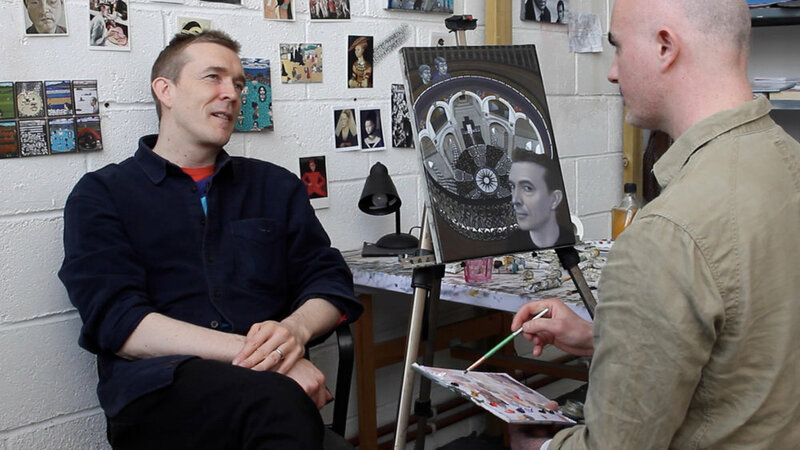 Watch short video about the making of Waterloo Bridge painting here. Watch short video about the making of Piccadilly Circus painting here. Contemporary re-enactment of 7th October 1970, when Tony and Maureen sat next to each other on a bench in Regents Park London and got talking. They went on to have a family and founded the travel guide company 'Lonely Planet'. Tony and Maureen Wheeler collection. 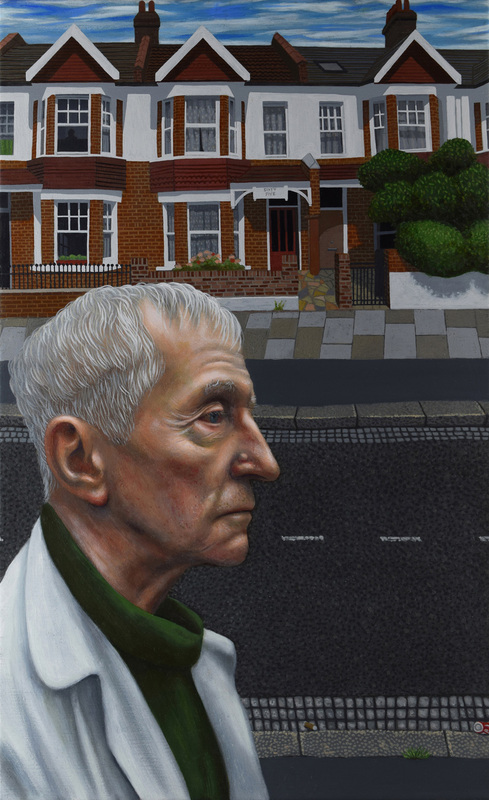 ‘London Portraits’ are series of paintings of people who have contributed to British culture and society, with each being asked to choose a place in London for the backdrop of their portrait. 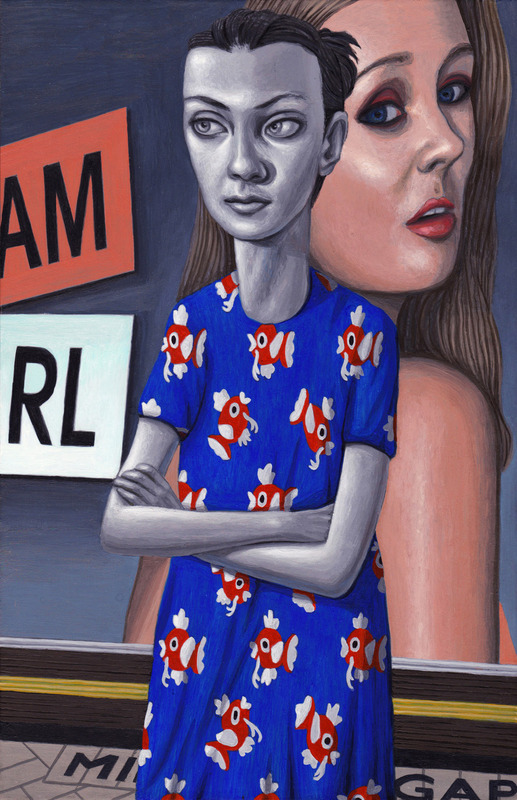 Prints of these paintings on sale at the National Portrait Gallery London. Comedienne Jo Brand chose The Comedy Club as the backdrop of her portrait because she started her career there. Exhibited at The Royal Society of Portrait Painters Exhibition 2017, the Mall Galleries London. Signed prints of this painting on sale at the National Portrait Gallery. 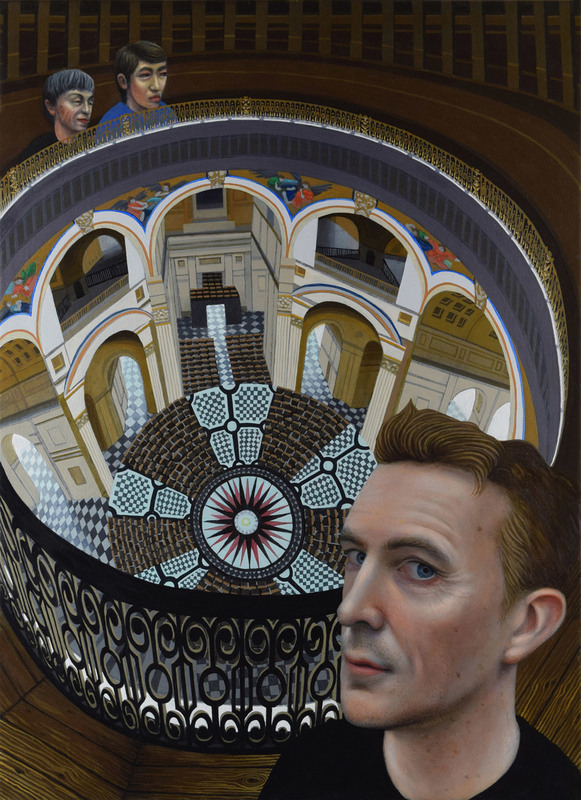 Novelist David Mitchell chose the Whispering Gallery in St.Pauls Cathedral as the backdrop of his portrait because he has visited there every decade of his life, and he feels it's dome-like structure is like the inside of a writers head. Exhibited at the 2017 Lynn Painter-Stainers Prize, The Mall Galleries, London. Signed prints of this painting on sale at the National Portrait Gallery. Actress Julie Walters chose The Royal National Theatre as the backdrop of her portrait because she has performed there at various times throughout her career. Exhibited at The Royal Society of Portrait Painters Exhibition 2017, the Mall Galleries London. Signed prints of this painting on sale at the National Portrait Gallery. 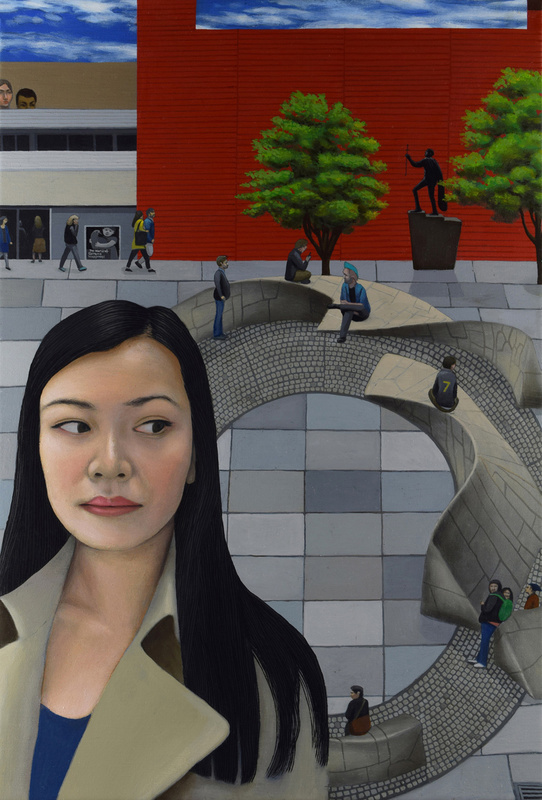 Actress Katie Leung chose The Shed on the Southbank as the backdrop of her portrait because she was invited to perform in the play 'The World of Extreme Happiness' there in 2013. Exhibited at the 2017 Lynn Painter-Stainers Prize, The Mall Galleries, London. Signed prints of this painting on sale at the National Portrait Gallery. 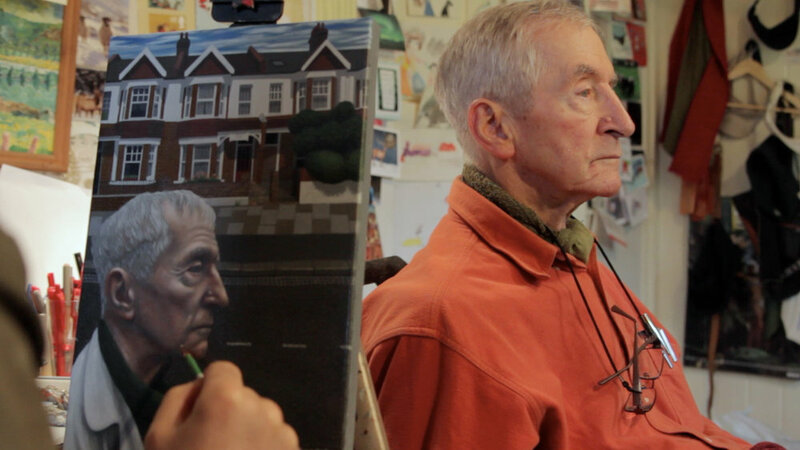 Author/Illustrator Raymond Briggs chose 65 Ashen Grove as the backdrop of his portrait because he was born and brought up in the house, and it also features in his book ‘Ethel and Ernest’. Signed prints of this painting on sale at the National Portrait Gallery. 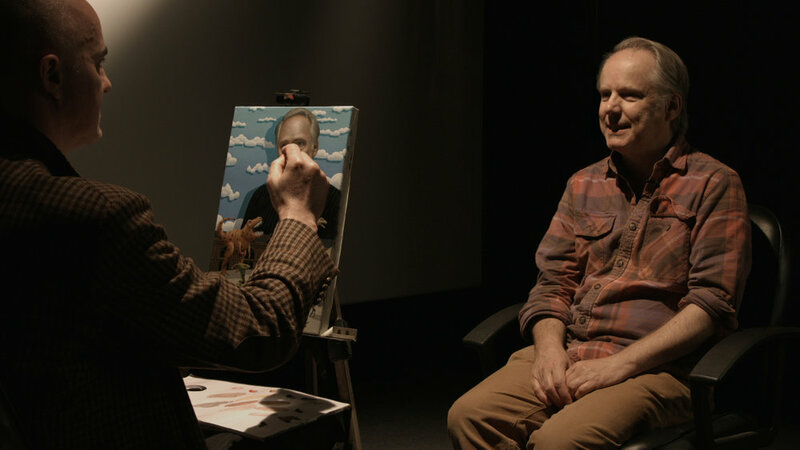 Director/Animator Nick Park chose the Dinosaur Gallery at the Natural History Museum as the backdrop of his portrait because he used to visit and sketch the dinosaurs there when he was a student. Signed prints of this painting on sale at the National Portrait Gallery. 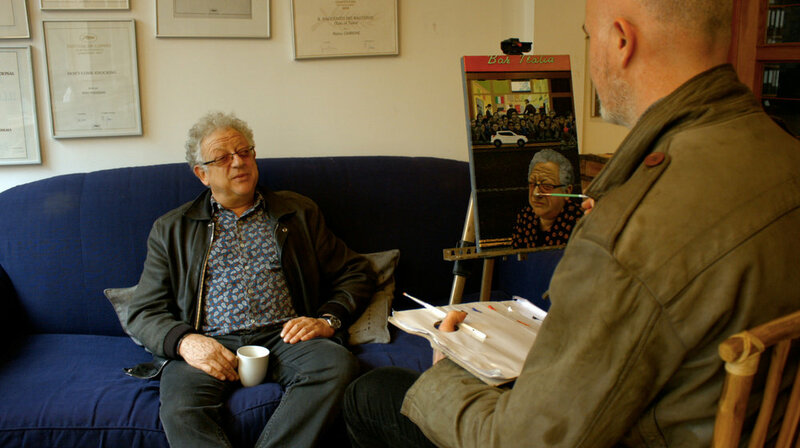 Movie producer Jeremy Thomas chose Bar Italia in Soho as the backdrop of his portrait because it is close to his Recorded Picture Company office, he visits there regularly for coffee, and he likes Italian culture. Signed prints of this painting on sale at the National Portrait Gallery. 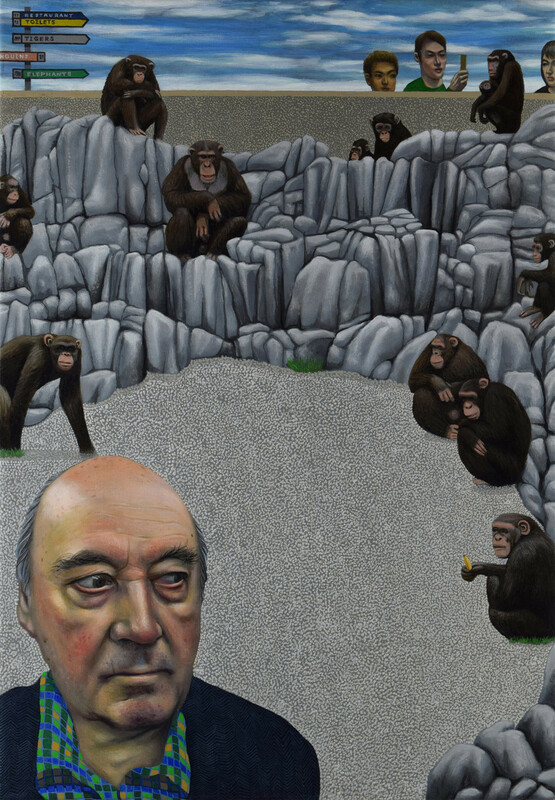 Zoologist Desmond Morris chose The Monkey Pen at London Zoo as the backdrop of his portrait because he has studied the behaviour of monkeys there for many years. Desmond Morris wrote the foreword to Carl Randall's Japan Portraits catalogue. Signed prints of this painting on sale at the National Portrait Gallery. 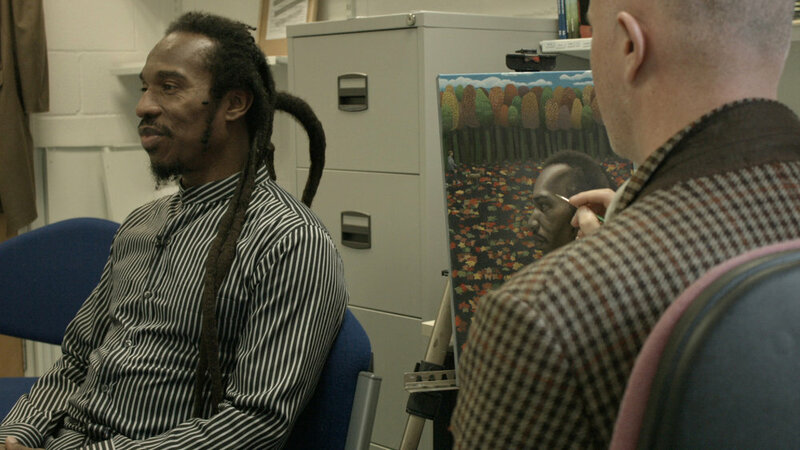 Poet Benjamin Zephaniah chose Epping Forest as the backdrop of his portrait because he likes escaping from the city into nature and practises karate in the forest. Signed prints of this painting on sale at the National Portrait Gallery. 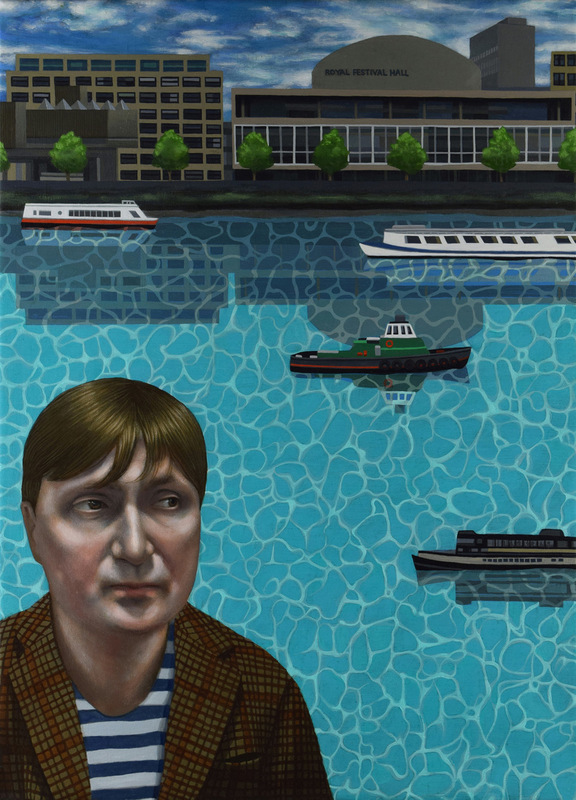 Poet Simon Armitage chose The Royal Festival Hall on the Southbank as the backdrop of his portrait because he was writer-in-residence there 2009 – 2012. Signed prints of this painting on sale at the National Portrait Gallery. 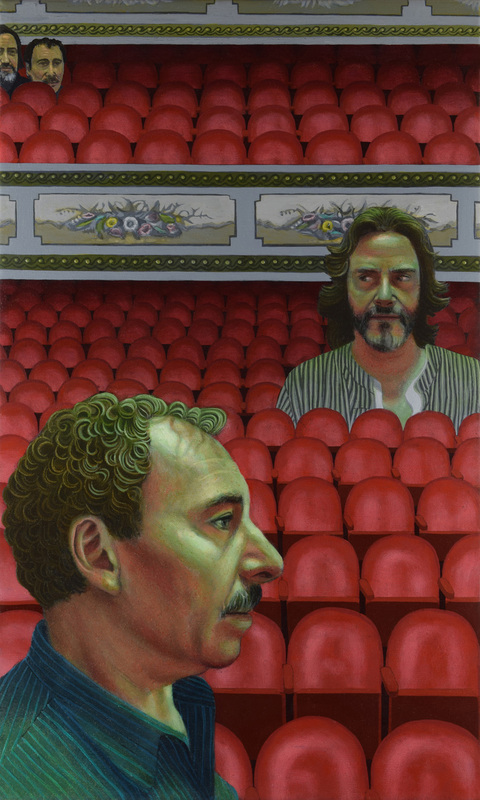 Actor Sir Antony Sher and Director Greg Doran chose The Noel Coward Theatre as the backdrop of their portrait because they worked there on the 2015 play ‘Death of a Salesman’. Signed prints of this painting on sale at the National Portrait Gallery. Graphic Novelist/Illustrator Dave McKean chose St.Giles Church as the backdrop of his portrait because it was a meeting place in London for artists he collaborated with at the start of his career (including writer Neil Gaiman). Signed prints of this painting on sale at the National Portrait Gallery. Dancer Akram Khan chose The Skate Park on the Southbank as the backdrop of his portrait because he relates to the young skaters as outsiders in society. Signed prints of this painting on sale at the National Portrait Gallery. 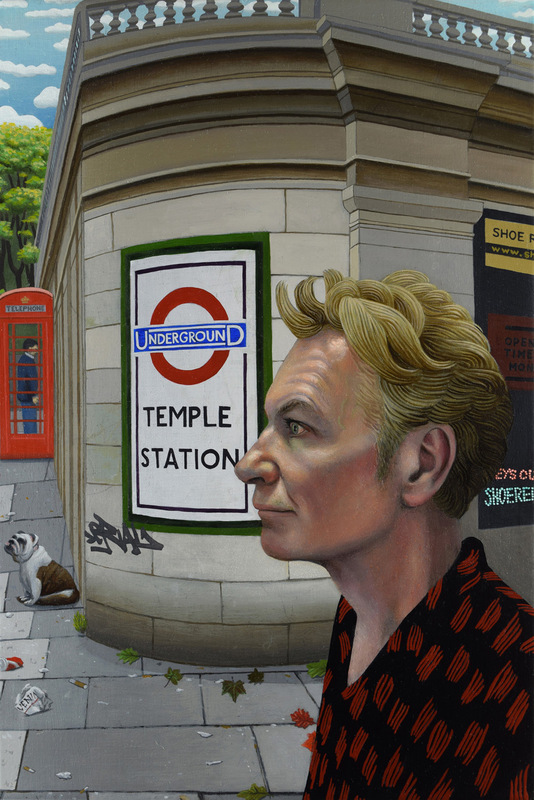 Film-maker Julien Temple chose Temple Tube Station as the backdrop of his portrait because he likes the architecture and pre-war ambiance of the station. Signed prints of this painting on sale at the National Portrait Gallery. 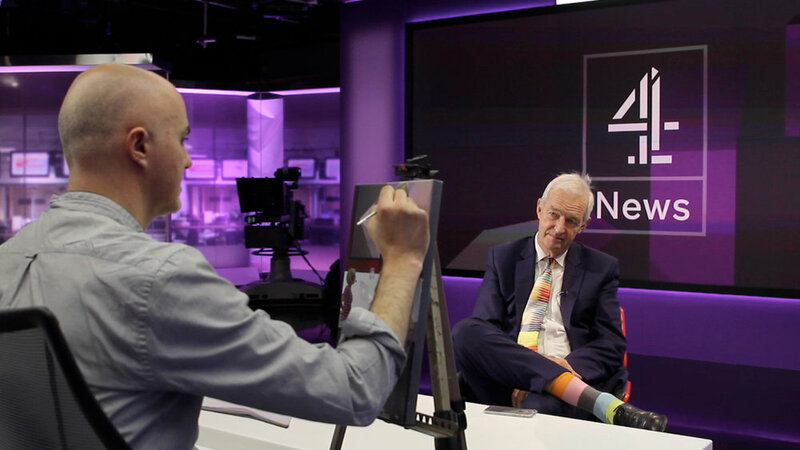 Newscaster Jon Snow chose Channel 4 News Studios as the backdrop of his portrait because he has worked there for almost 30 years. Signed prints of this painting on sale at the National Portrait Gallery. Still from the documentary video '‘Carl Randall - London Portraits’. Watch video here. Exhibited at 'Small is Beautiful 2017', Flowers Gallery, Central London. Exhibited at ‘Small is Beautiful’ 2018, Flowers Gallery, central London.